As you can see from my meals below, I don’t mind eating the same things over and over. I ate the same thing for breakfast and lunch for the first 5 days and the only variety are my dinner meals. I keep it simple and prepping on the weekend helps me stay compliant the whole week. I’m feeling really good at the end of Week 1. The most change I see is the increase in energy so I’m planning to start adding workouts next week. I also have less bloat, which means I’m fitting into more clothes. I’m enjoyed the food this past week and I feel I can still complete this in 30 days. I prepare the same food for my husband and toddler, they will eat the Whole 30 protein and veggie dishes but they will also add rice or other carbs with their meals. Signing up for the daily email help me a ton, it kept me informed on what to expect of my day, about moods and stuff. One thing that stuck with me this week from what I read on the daily email was the difference between hunger and cravings. I asked myself numerous times the prompted question to determine whether I was truly hungry or just cravings food out of habit. 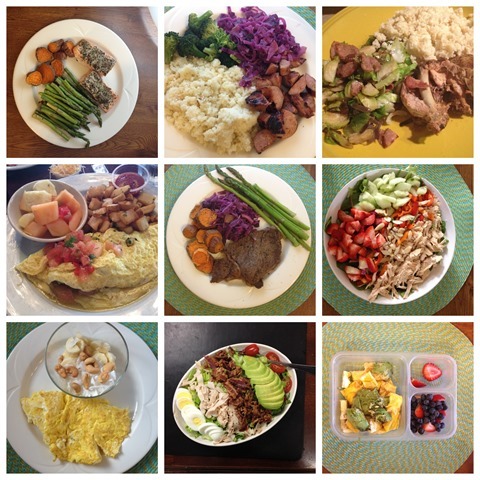 I didn’t think I would log all my food (as I find it boring to write and also time consuming) BUT I find it helpful when I’ve read other people’s food log while on Whole 30 so I’m posting all my meals for Week 1 so it can help others and so I can reference someone to this post in the future. This was prep day, I bought groceries from Sprouts and Costco (lucky me they are across from each other), chopped up veggies, roasted sweet potatoes and made breakfast casserole to eat throughout the week. I bought protein from Costco, their grass fed beef and chicken breast and tons of fruits. I bought salad ingredients and other produce from Sprouts. I baked and enjoyed a chocolate cake tonight but ate less than I thought I would, it was too sweet for my taste. I did savor each bite knowing I would be breaking up with sugar in the next 30 days. I also signed up for the daily Whole30 email (there’s extra fee), hoping this will add encouragement and motivation. I felt: Woke up bloated from the cake yesterday (I already knew this was going to happen), and didn’t have restful sleep. Woke up with a sore throat and was grumpy all day. Not the best day to start when I’m feeling sick. We were out most of the day at the Zoo and I took a nap after we got home. Ready Day 1 email from bed, really loved the early pep talk. I felt: I’m feeling better today, bloating has lessened and I wore stripe pencil skirt to work and it fit comfortably. I also brought back black coffee + coconut milk in the morning, drank tea throughout the week. Reached out to Christina for support and encouragement, thanks friend! I haven’t worked out all week and I’m itching to get some physical activity soon. I felt: I woke up so rested and relaxed this morning, I thought it was the weekend and that I was sleeping in. I glanced at my phone and realized it was Thursday 6am, and didn’t need my alarm to wake up. I can get used to this It was stressful at work today and when I’m stressed and frustrated, I reach out for food. Instead of candy, I snacked on nuts throughout the day. I wasn’t satiated with my breakfast and maybe that’s why I kept reaching for snacks? Lunch: cobb salad from a restaurant, no cheese. I used Tessamae dressing. I felt: First day that I am not feeling sick, I’m itching to get active again. I feel lean already, I thought it was just mental but I was able to fit into some work pants that I haven’t worn in a year. I am definitely less bloated. I was solo in the evening and I used that time to look at cookbooks and online recipes for next weeks meal. I’m not tired of the food yet but I still have three weeks to go. Dinner: roasted chicken, guacamole, salsa served on lettuce wraps. I had about 3-4 servings. Also ate baked plantain chips + guac for appetizers. I felt: I woke up early and finished 30 minutes of Upper Body Workout DVD. I have a lot of energy and even wanted to clean around the house afterwards. We had an early appt with our accountant so had to eat breakfast on the road. We visited the in-laws and took a nap when we got home. Lunch was late at 3pm and I was getting hungry + angry. We celebrated my Mom’s birthday at my sister’s house and there were compliant foods there. I also baked lemon bars for the celebration, hubby said it tasted good (since I couldn’t eat it). I thought I would be tempted to eat the sweets since I was baking it, but I really wanted to make something special for my mom’s birthday and I was glad I didn’t give in. I thought to myself afterwards, that I will not do this again…..bake something, I can’t eat. Brunch at 10:30: (Restaurant Meal) 2 egg omelet with lots of veggies, potatoes and fruits (asked for cheese & toast on the side and gave it away to my friends). I felt: I am glad I was able to stay compliant while dining out, although I didn’t ask whether the omelet was cooked in oil or butter? I assume oil. We were celebrating a birthday so after brunch, we headed over to a cupcake place. I watched my friends enjoyed the cupcakes and although it looked good, I wasn’t tempted at all. Watched a movie at the theater afterwards, and I brought a bag of blueberries to snack on. I got home late afternoon and spent the rest of the day doing food prep for Week 2. Awesome job! I’m so glad you already feel an increase in energy. You’re gonna be flying high when you’re done, haha! !